Today, approximately 27% of households in the United States own at least one cat. This comprises a total of almost 60 million total pet cats. An 8 billion dollar pet food industry and the more than 7 billion dollars that pet owners spend on veterinary care each year provide tangible evidence of the increasing importance that companion animals have in our society. Additionally, the bond that owners have with their cats and the many health benefits that are afforded by this bond have been the topic of numerous research studies in the past 25 years. The cat as a cherished companion is here to stay, and many owners, students and pet professionals are eager to learn more about man’s OTHER best friend, Felis catus. The Cat: Its Behavior, Nutrition and Health, the textbook of the cat, is written as a companion book to The Dog: Its Behavior, Nutrition and Health. This book provides pet owners, undergraduate students and pet professionals with a complete guide to four topical areas that are of interest. These are: The history of the human-cat relationship; behavior of the domestic cat; feline nutrition; and feline health and disease. The Cat will fill the need for an academic textbook for undergraduate animal science courses, veterinary technician programs, and cat care or breeding classes. It will also serve as an important resource for pet professionals such as breeders, exhibitors, groomers, and veterinary practitioners. Linda P. Case coordinates the undergraduate companion animal program and teaches companion animal science in the Department of Animal Sciences at the University of Illinois, is a Consultant for the Aims Company, and owns AutumnGold Dog Training Center In Mahomet, Illinois. 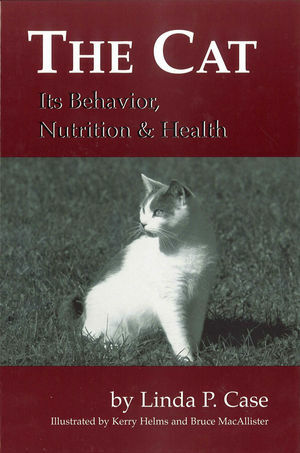 Case is also the author of The Dog: Its Behavior, Nutrition and Health (199), and Canine and Feline Nutrition: A resource of Companion Animal Professionals (2000). PART 1 Knowing the Cat within the Companion. Chapter 1. Felis sylvestris to Felis catus: Domestication. Chapter 2. Selective Breeding: Breeds from the Everyday to the Unusual. Chapter 3.The Cat's Perception of the World: Structure, Movement, and Special Senses. Chapter 4. Reproduction and Breeding Management. Chapter 5. Genetics: Why All Cats Are Tabbies. Chapter 6. The Human-Cat Relationship: Benefits and Responsibilities. PART 2 Behavior: Understanding the Domestic Cat. Chapter 7. Developmental Behavior: From Kitten to Adult. Chapter 8. Social Life: Communication Patterns, Social Relationships, and Territoriality. Chapter 9. How Cats Learn (or Learning to Train a Cat!). Chapter 10. The Misbehaving Cat: Behavior Problems and Solutions. PART 3 Health and Disease: Keeping Cats Healthy and Happy. Chapter 12. Bacterial, Fungal, and Protozoan Diseases. PART 4 Nutrition: Feeding for Health and Longevity. Chapter 17. The Cat as an Obligate Carnivore: Nutrient Requirements. Chapter 18. Providing a Healthy Diet: Cat Food Selection and Evaluation. Chapter 19. Feeding Management Throughout the Life Cycle. Chapter 20. Nutritionally Responsive Diseases.